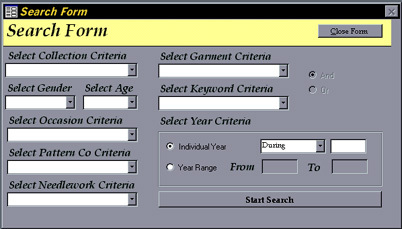 This form allows you to search the database records using one or a combination of several criteria: collection, type of garment, gender, age, keyword, occasion, pattern company, or needlework. Optionally, you may choose to search a specific date or range of dates for pattern information. The drop down arrows in each of the criteria selection boxes facilitates the search process by presenting you with a list of appropriate search terms for each criterion. For example, clicking the drop down arrow in the "Select Pattern Co Crieria" box will present the user with a list of the pattern companies which are represented in the database. Once a search is completed, the Search Form will be closed, and the Data Entry Form will be opened where the records which match the search criteria are presented. The search form can be reached through either Read Only or Editable Mode.